Timber flooring comes in many forms, varying in thickness, width, laying patterns, types of glues and underlays used. Each type of timber flooring in itself needs a different specialized technique to remove. There are three main types of timber flooring; direct stick, plank on ply and floating timber floors. Direct stick timber floors such as parquetry are glued directly to the sub floor (concrete slab). 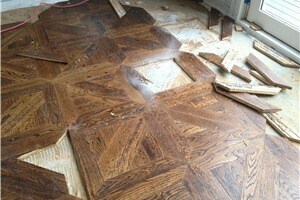 These floor coverings are very difficult to remove and are generally well bonded to the slab. The removal process involves cutting the floor covering into smaller sections and separating it from the slab with a specially designed blade and jackhammer. 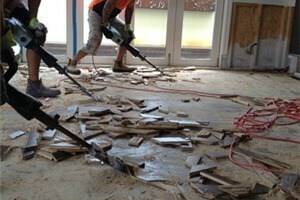 This process is effective in almost all applications with little sub floor damage. The second stage of this process involves heavy grinding which removes the remainder of the glue and ensures the slab is clean, smooth and ready for re covering. Plank on ply timber floors are those which have an underlay between the floor covering and the sub floor. The underlay is generally a compressed cement sheeting or ply wood. These floor coverings are usually glued and nailed to the underlay which is then glued, nailed or both, to the sub floor. The removal process involves cutting the floor covering and underlay into smaller sections and lifting off the sub floor. Once this is completed, all the existing nails are removed from the slab/ timber floor and a light grind is given if there is any glue residue (concrete slab only). The area is then thoroughly vacuumed and left clean. Floating timber floors are floor coverings that lay unattached to the sub floor. These floor coverings are quite easy to remove as there is no glue holding them down and no grinding is required after removal. All Stripped remove floating timber using a specially designed blade which skims the surface of the sub floor minimizing any damage. After this is completed, the area is vacuumed and cleaned to leave ready for re laying. All Stripped has been an industry leader in timber removal for almost 15 years. Our processes are amongst the fastest and most professional in the industry ensuring that all customers needs are met on time every time. All Stripped work with many tilers and floor layers and ensure floors are left smooth, clean and ready for re laying. This reduces the turn around time on projects causing less disruption to business trading and costs. No one can remove timber flooring as efficiently as All Stripped.